Thank you for giving us a chance to serve you. Caring for your nails is our specialty and Diamond Nails and Spa strive to give our guests the highest quality manicure and pedicure services at affordable prices. We take great pride and care to ensure your tired hands and feet receive the kind of treatments that will leave you feeling invigorated and revitalized each time you visit us. The professionals at Diamond Nails & Spa uses the best nail products and moisturizers to help protect and restore your nails to the beauty, sheen and luster that it needs. And with regular care, your nails will last a lifetime. Cleanliness is an important factor for everyone and at Diamond Nails & Spa only new files, buffers and foot files will be used for every clients. Our clean and relaxing atmosphere is created for both our guests and our staff to feel more comfortable. This helps to relieve the daily stress and tensions that everyone goes through each day. Diamond Nails & Spa opened their first spa several years ago and have grown into three spas in Colorado with two in beautiful Evergreen, CO. It is the Van’s passion for service that has made them a success in Colorado. They understand that success is measured by each customer’s satisfaction. For that reason, Diamond Nails & Spa and their staff are committed to building their business one customer at a time. 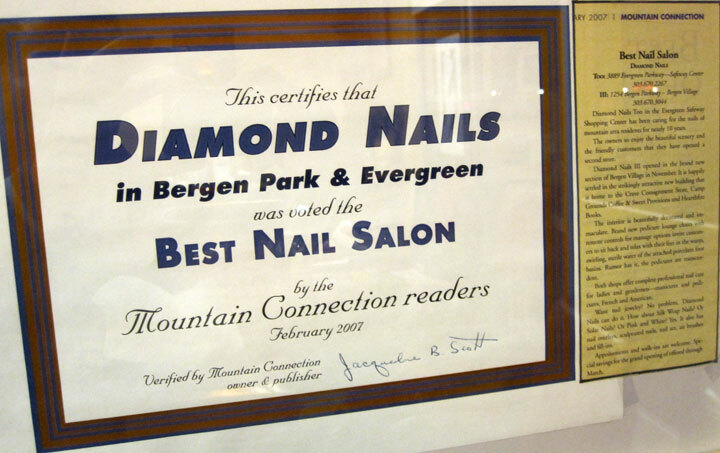 Diamond Nails and Spa would like to invite you to visit us in Evergreen, CO today to experience the beautiful Colorado mountains and indulge in a relaxing full nail service experience.